On 28 January, Sauli Niinistö was re-elected as Finland’s President in the first round of voting. Tapio Raunio explains that with voters clearly approving of Niinistö’s track record in office, the other mainstream candidates found it extremely difficult to challenge him. The result means continuity for Finnish politics: Niinistö is not in favour of NATO membership, but supports the development of the EU’s security and defence policy, bilateral security policy cooperation with Sweden, and maintaining close ties with NATO. When finishing second in the Finnish 2006 presidential election, Sauli Niinistö commented that it is difficult to beat the incumbent president. In the first round of the presidential election held on 28 January, this rule worked in his favour, as Niinistö secured his re-election with a comfortable 62.6% of the vote. This was the first time the president had been elected in the first round since the move to direct elections in 1988/1994. Turnout was 69.9 % (including only those resident in Finland), just below the 70.1% achieved in the last parliamentary elections held in 2015. 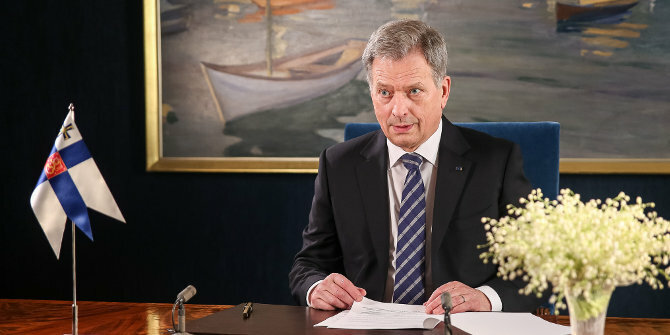 Elected in 2012 as the candidate of the National Coalition, the conservative party that he chaired from 1994 to 2001, Niinistö had announced last May that he would seek re-election as an independent candidate. The National Coalition nonetheless indicated that it would endorse Niinistö’s campaign, and the party indeed campaigned actively in support of Niinistö. The Christian Democrats also decided to support Niinistö instead of fielding their own candidate. Niinistö was the clear favourite throughout the campaign. In all the polls conducted since last summer, between 60-80% said they would vote for Niinistö. While Niinistö has always been quite popular outside of his own party, contextual factors also favoured the president. The war in Ukraine and the overall aggressive foreign policy of Russia have increased tensions in the neighbouring area, with these circumstances facilitating presidential activism. Bilateral ties with Russia became more important, and Niinistö’s high-profile meetings with Putin and other leaders received extensive friendly media coverage. Here one needs to remember that Finns are used to seeing the president as the guarantor of national security, and the unusually high approval ratings indicate that voters appreciated Niinistö’s foreign and security policy leadership. Another, quite different, boost to Niinistö’s campaign came in the form of an announcement in October by the president and his wife Jenni Haukio that they were expecting a baby in February. Niinistö, who turns 70 in August, also has two adult sons from his previous marriage. Given that voters clearly approved of Niinistö’s track record in office, the other ‘mainstream’ candidates found it extremely difficult to challenge him. The constitutional prerogatives of the president are essentially limited to co-leading foreign and security policy with the government, and the debates largely focused on familiar themes – relations with Russia, the European Union and potential NATO membership. To be sure, there were some relatively minor differences, with the left-leaning candidates – Merja Kyllönen (Left Alliance), Tuula Haatainen (Social Democrats), and Pekka Haavisto (Green League) – putting more emphasis on global issues and equality, while Niinistö and Matti Vanhanen (Centre Party) in turn adopted more ‘realist’ positions. This was most evident in debates concerning relations with China, as two giant pandas donated by China arrived in Finland in mid-January. Also, the question of Finland’s arms trade with Saudi Arabia revealed such differences, with the left-wing candidates more strongly opposed to the arms sales. Nils Torvalds (Swedish People’s Party) was the only candidate openly supportive of NATO membership. At least some colour and ideological alternatives were brought to the campaign by Laura Huhtasaari (The Finns Party) and Paavo Väyrynen, currently an MEP and a long-standing, popular yet controversial, Centre Party politician who was running as an independent candidate having been the presidential candidate of the Centre Party in the 1988, 1994 and 2012 elections. Both Huhtasaari and Väyrynen utilised anti-EU discourse, with Huhtasaari in particular also advocating much stronger powers for the president, including the right to dissolve the parliament. Such sentiments are shared by the electorate, with surveys reporting that most Finns would favour a stronger presidency and that the president should also be involved in domestic politics and EU affairs. The other candidates appeared by and large willing to respect the constitutional division of labour between the state institutions, but essentially all of them nonetheless flirted with the idea of an active president that would also, if needed, intervene in domestic matters. Turning to the results, the elections were another major disappointment for the political left. Appealing primarily to the more liberal, urban, green-left younger voters, Haavisto finished second with 12.4% of the vote. This was obviously a clear disappointment, given that six years earlier Haavisto had made it to the second round against Niinistö. The personal popularity of Haavisto combined with the recent rise of the Greens in Finnish politics undermined the prospects of Kyllönen and Haatainen. Kyllönen, an MEP known for her colourful rhetoric, finished with 3% of the vote. The Social Democrats in turn had experienced major difficulties in finding a credible candidate, and Haatainen, known for her expertise in social and health policy, was clearly outside of her comfort zone, receiving a dismal 3.2% of the vote. This meant that the Social Democrats once again fared poorly in presidential elections, with their more high-profile candidate Paavo Lipponen, the prime minister from 1995 to 2003, winning only 6.7% of the vote in the 2012 elections. The main excitement in the Centre Party was over whether Väyrynen, who had severed ties with his party in the early 1990s over EU membership, would beat Vanhanen, who served as the prime minister from 2003 to 2010. The race was indeed quite close, with Väyrynen getting 6.2% and Vanhanen 4.1% of the vote. To put it mildly, the outcome was a major embarrassment to Vanhanen and his party. Torvalds received 1.5% of the vote. Huhtasaari, the candidate of the populist and anti-immigration Finns Party, won 6.9 % of the vote. Her party effectively split into two last June after the party congress had elected MEP Jussi Halla-aho, convicted in court for hate speech, as the new party leader. Immediately following the election of Halla-aho, the more moderate or populist wing of the party left the Finns and established a new party, the Blue Reform, which did not nominate a presidential candidate nor support any of the candidates. Huhtasaari was also the youngest (38) and least experienced of the candidates, having first entered the parliament in the 2015 elections. Hence, she clearly performed well, and, together with Väyrynen, the combined vote share of the two Eurosceptic candidates was 13.1%. Overall, the results mean continuity in Finnish politics. Niinistö is not in favour of NATO membership, but supports the development of the EU’s security and defence policy, bilateral security policy cooperation with Sweden, and maintaining close ties with NATO, views largely shared by the mainstream parties and the public. Support for NATO membership has remained remarkably stable over the years, with around 20-25% of the electorate in favour of membership. National Coalition is the only party in favour of NATO membership, and even it does not campaign actively on the issue. Given that the decision to apply for membership would require the consent of both the government (and the parliament) and the president, it is unlikely that Finland’s relationship with NATO will change in the near future. During his first six-year term, Niinistö shared power with cabinets led by centre-right prime ministers, and this clearly contributed to smooth co-leadership in foreign policy. It also facilitated presidential activism, especially since the 2015 parliamentary elections as PM Juha Sipilä has prioritised domestic issues such as reviving the economy and the re-organisation of social and health services. Hence the results of the next parliamentary elections scheduled for spring 2019 and the personality of the next PM will be important in terms of Niinistö’s second term in office. Tapio Raunio is a Professor of Political Science at the University of Tampere. His research interests include the role of national legislatures and parties in European integration and foreign policy, the European Parliament and Europarties, semi-presidentialism and the Finnish political system.